If your General Ledger Control Record and Chart of Accounts have not been set up, you must do that first. See GL Setup. 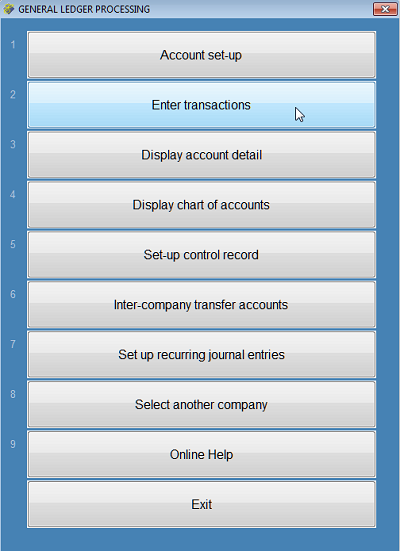 Go to Back Office - General Ledger - General Ledger Processing - Enter Transactions - Add Transactions. The Transaction Entry screen will open. This is the current batch on your workstation. Press Enter go move from field to field. CO is auto-populated with the Company number you are in. You cannot change this. SEQ is the sequence number auto-assigned by the system. You cannot change this. If you delete a transaction, that sequence number will be missing. ACCOUNT is where you enter the GL account code. JRNL is a user-defined field where you will enter the two-character journal code. DATE is where you will enter the transaction date. Note that the debit and credit entries should have the same date. REFERENCE is where you can type a reference such as check number, account number, or anything you will find helpful in detail look-up or on reports. AMOUNT is the amount of the transaction. 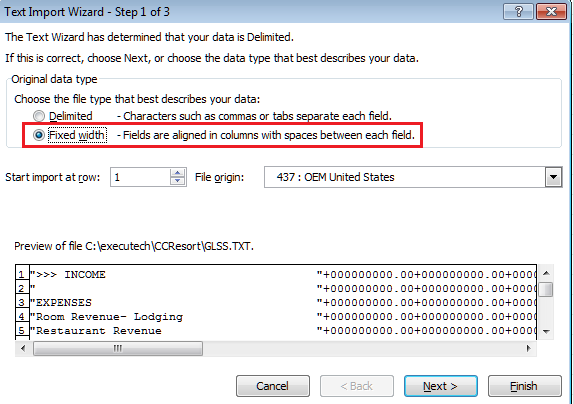 You will need to type the decimal if cents are included; you do not need to type the decimal and trailing zeroes if it is an even dollar amount. NOTE: If you are posting a credit you will need to type a minus sign. COMMENT is where you can type any comment that will be helpful on account detail look-up or on reports. Ok? At this prompt, press Enter to accept the entry and go to the next line/ Type N to start this transaction again. When you are finished, make sure that debits equal credits. This will display at the bottom of the screen. 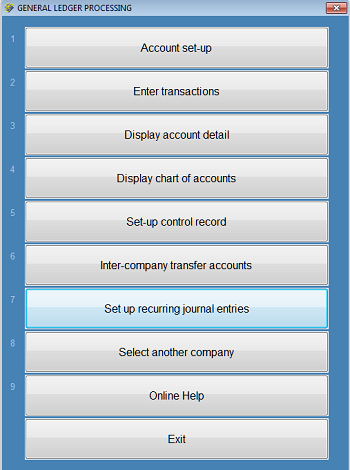 Go to General Ledger Processing - Set up Recurring Journal Entries. 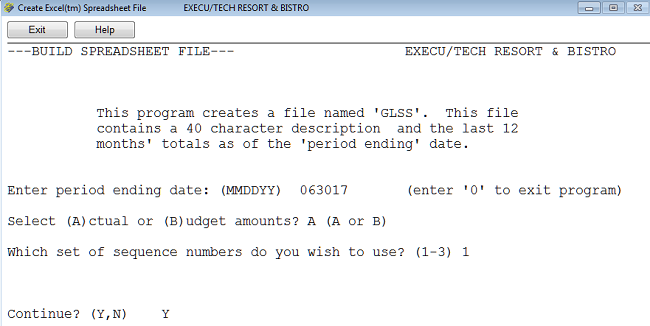 If you have not yet set up templates, see "Set up recurring journal entries" in the GL Setup guide. At the prompt, enter the description of the template you want to use. If you do not know it, you can type L and press Enter of click the Look-up button. A list of recurring journal entry templates will display. Select the desired template. The existing template will open. To change the date you can type the new date in the "Posting date" field or you can click the "Set posting date" button at the bottom of the screen. You can change the amount or leave the amount from the previous posting. You may change the Reference or Comment, or leave as is. When you are finished, click the "Post entries" button at the bottom of the screen. Click Save to save the changes. You may post additional journal entries if you wish. When you are finished, remember to update the General Ledger batch. Go to Back Office - General Ledger - General Ledger Processing - Enter Transactions - Review transactions. 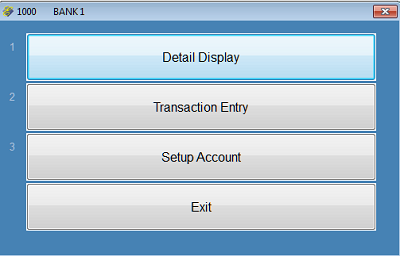 You can enter the beginning sequence number to display or press Enter to view all transactions. If there are more transactions than are visible, press Enter to continue to see more. Make sure to update the batch. See also Making Corrections in Current Batch. Manual postings - these batches will be on the computer where the transactions were posted. Accounts payable processing - these batches will be on the computer where A/P was processed. 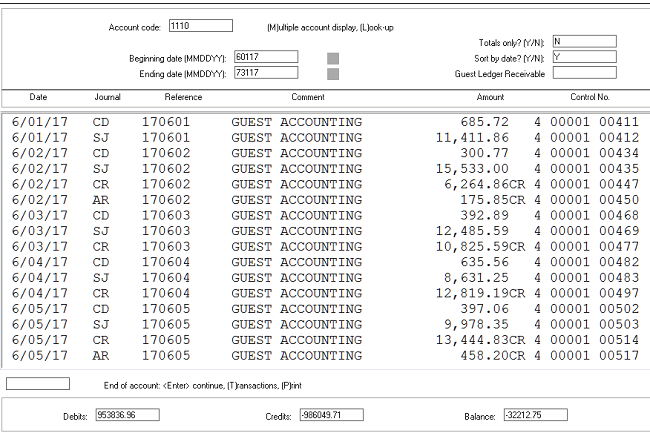 Accounts receivable (direct bill) processing - these batches will be on the computer designated in the A/R Control File, Parameter Record. 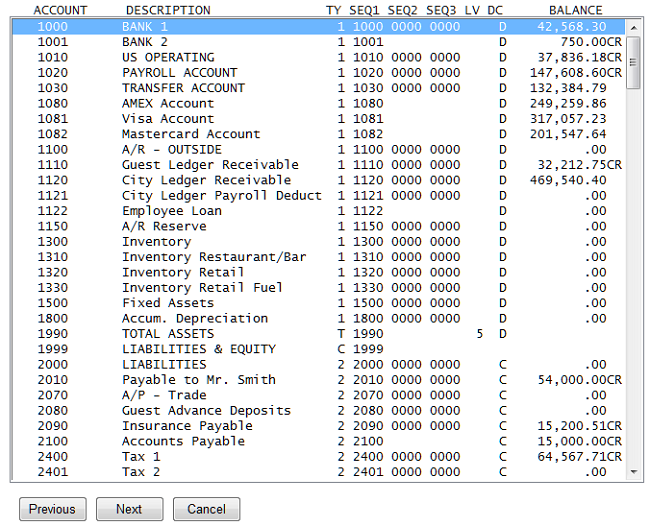 Payroll processing - these batches will be on the computer where payroll was processed. Inventory processing - these batches will be on the computer where the inventory batch was updated. The batch created at POS End of Day will be on the computer where End of Day was done unless otherwise specified in MENUINI.FIL. Hotel PMS night audit - these batches will be on the computer designated in the Hotel Parameter Record in the Manager/Setup menu unless otherwise specified in MENUINI.FIL. Condo processing - these batches will be on the computer where condo processing was done. The nightly audit batches from "Transfer room charge to Condo" will be on the computer where night audit was done, unless otherwise specified in MENUINI.FIL. Stand-alone POS - these batches will be on the computer where POS End of Day was done. This does not apply to POS systems for Execu/Suite PMS users; those transactions go through Hotel PMS. Since GL batches can not be printed after they are updated, we do not recommend printing to screen (Preview) unless you want to print a preliminary copy (answering No to Update). Execu/Tech can add the batch updates to your Night Audit YYYYMMDD.TXT archive if you wish. We do not do this by default due to the sensitive nature of the data. Go to Back Office - General Ledger - Print and Update Transaction Batch. If you wish to print the batch without updating, answer No to "Do you wish to update batch * now?" Answer Yes to update. If you answer No, remember to go back in and update the batch. Answer No to "Post TOTALS only to Accounts Payable Control Account?" If you answer No, then you will have separate A/P postings for each A/P invoice that you created. This will make it easier to research and troubleshoot down the road should you need to. Answering Yes will post a sum for all A/P invoices in the batch. When the batch has been updated, the bottom of the printout will state this, as shown below. You can print the batch without updating to find out what you need to do to fix the batch. In the example below, an A/R transaction posted to an invalid account. This can happen if an invalid account number was set up in the A/R control record. This also can happen if invalid account codes are entered in any program that interfaces to General Ledger, such as Payroll or Execu/Suite PMS. See GL Integration. You will need to correct the transaction that is causing the error, then update the batch. See Corrections to Current Batches. 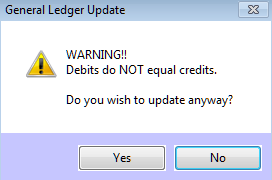 You will see a warning if debits do not equal credits. 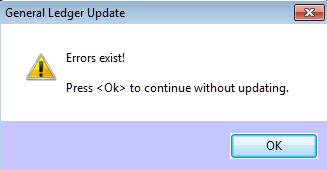 You should not update the batch unless you are deliberately creating an out-of-balance batch to correct something. Otherwise, you should print the batch to determine why it is out of balance, and fix it. See Corrections to Current Batches. 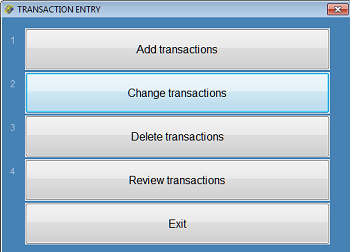 You will need to know the sequence number of the transaction you want to change. You can go to Review Transactions to find it. Go to Back Office - General Ledger - General Ledger Processing - Enter Transactions - Change transactions. The current batch number will display. You cannot change a prior batch. Enter the sequence number to change. When you're finished with the change, you can enter additional sequences to change if necessary. You can review the batch if you wish. Then, remember to update the batch. You will need to know the sequence number of the transaction you want to delete. 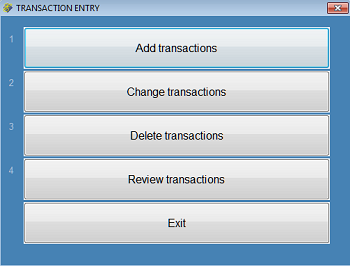 You can go to Review transactions to find it. Go to Back Office - General Ledger - General Ledger Processing - Enter Transactions - Delete transactions. The current batch number will display. You cannot change a prior batch. At the prompt, enter the first sequence to delete. You will be prompted for the ending sequence to delete. 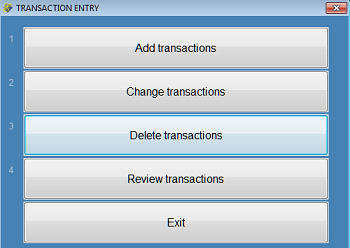 If you need to delete only one transaction, enter the same sequence number, as shown below. Each transaction within the sequence will prompt, "Delete this record?" Answer Y or N and press Enter. Go carefully; this cannot be undone. You can review the batch if you wish. Make sure your batch is in balance; debits should equal credits. Remember to update the batch. You cannot make corrections to prior batches. Once a batch is updated, it clears and a new batch is generated for new transactions. To correct something from a prior batch, you must post it manually. 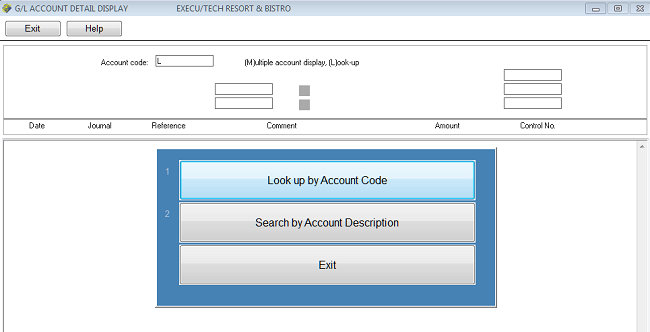 At the prompt, enter the beginning account number or press Enter to display all. The accounts will display as shown below. To select an account you may scroll down and click, or down-arrow and press Enter. When you select an account, you can display the account detail, post a transaction, or make a change to the account setup. Enter the account code. You can look up an account by account code or search by description. Enter through the fields, adding a beginning date and ending date if desired, and whether you wish to display totals only and sort by date. The transactions will display. Go to Back Office > General Ledger. 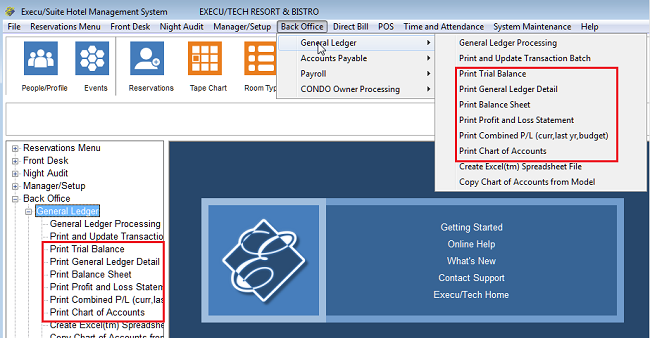 You can print directly to your default printer, or preview the reports prior to printing. From the Preview screen you can save the report as a PDF or a Text file. To preview, go to File - Select Printer - Preview (Print to Your Screen). Your Balance Sheet is the primary report to print for asset and liability/equity accounts. However, the Trial Balance is a useful report as well. Enter the period ending date. Answer N to "Do you wish to update account balances?" 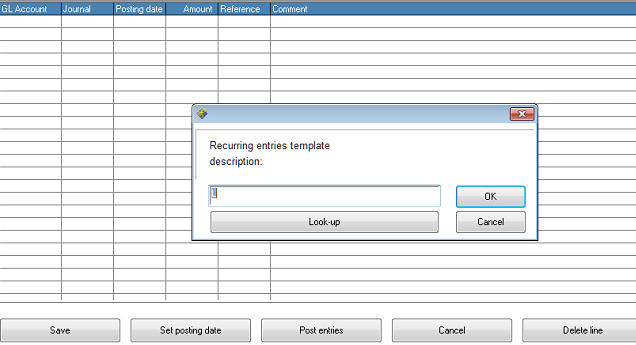 You can print the detail for one account or for a range of accounts for a specified period. This is a good report to print for tax liabilities, for example. Enter the period begin and ending dates. Enter the beginning and ending account numbers. Enter through these fields to include all accounts. Check "Print the specified department only" if you want to print the detail for only those departments. For example, of your beginning account number is 6666.04 and your ending account number is 7777.04, only account numbers for department 04 will print, if that is what signifies your department. See GL Setup for "department" explanation. 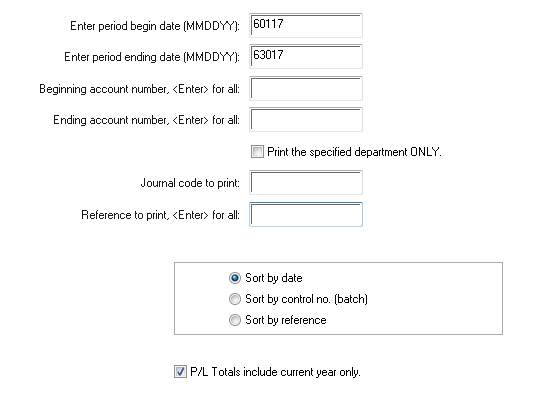 Enter a journal code to print if you want only that journal code, such as JE, to print. Otherwise Enter through this field. 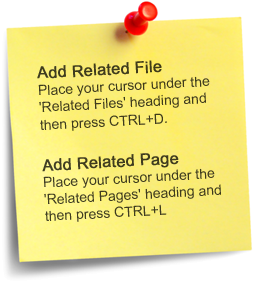 Type a reference to print if you wish or press Enter through this field. You can sort by date (default), control number (batch) or reference. Your Balance Sheet is the primary report to print for asset and liability/equity accounts. Enter the period ending date. 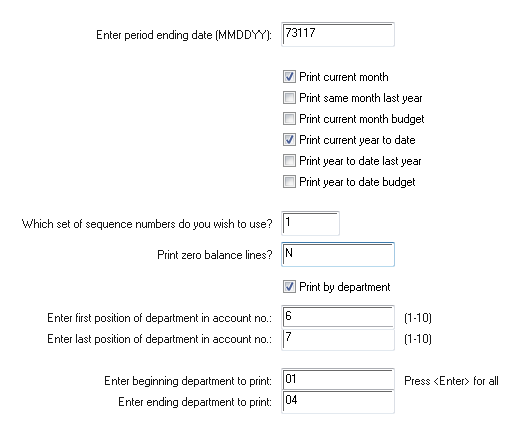 Depending on your desire, check "Print current month separately" and "Print zero balance lines" Enter the print sequence number. Default is 1. This is your income statement, showing income and expense accounts. Enter the period ending date. The period begin date will be the date you set up in the Control Record in GL Setup. Default print columns are "current month" and "current year to date". Click any additional columns to print. See also Combined P&L. Enter the sequence number you wish to use. 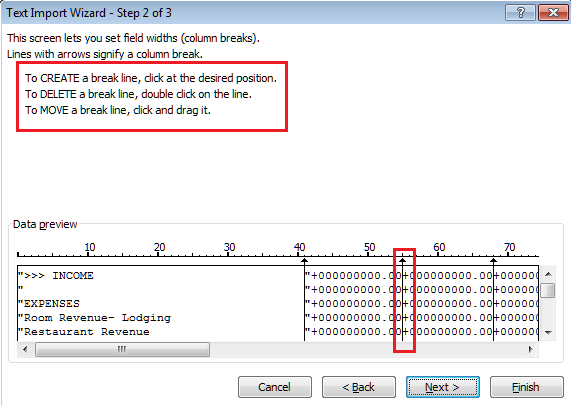 Answer "Y" to "Print zero balance lines" if you want those to print. Default is N.
If you wish to Print by department, click this option. Otherwise, you can skip the next four fields. Enter the first and last position of the department in the account number. For example, in account 6666.04, the account is signified by the sixth and seventh position, which is the 0 (zero) and the 4 (four). Enter the beginning and ending department to print or press Enter to print all departments. If you opt to Print by department, each department will print as a separate report. The combined Profit & Loss Statement is the same report as the Profit & Loss Statement except that it automatically prints current and prior year data including budgets. Enter the information as explained in Profit and Loss Report, except for the print columns. 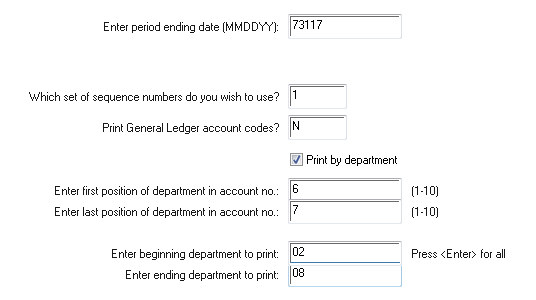 If you wish to print the General Ledger Account codes, answer Y to this field. From time to time you will want to print your Chart of Accounts. 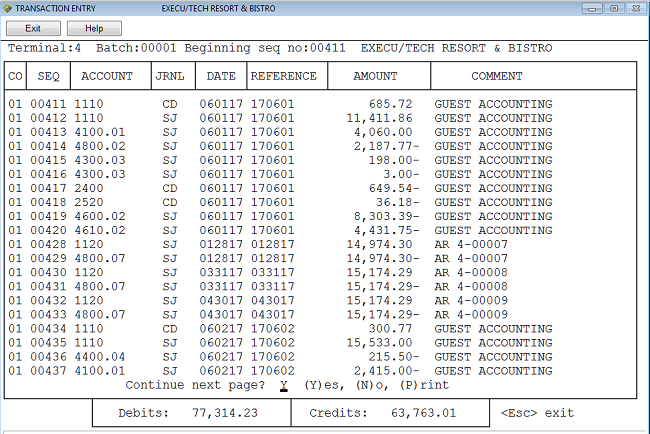 This program creates a file showing totals for each account for the last 12 months from the "as of" date. You will import that file into Excel or other similar program. Enter the period ending (as of) date MMDDYY. Enter A to show actual amounts or enter B to show budget amounts. 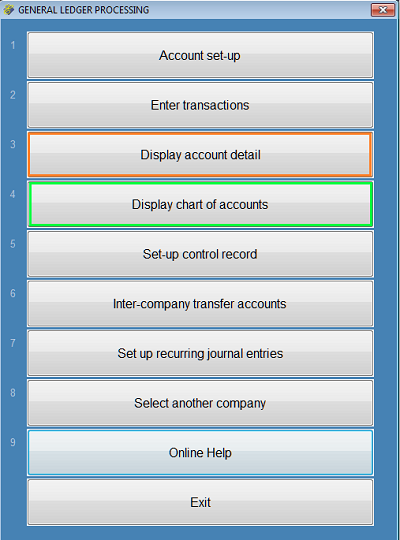 Enter the sequence number (1-3) to use for sorting/ordering the accounts. Answer Y to continue or answer N to start over. 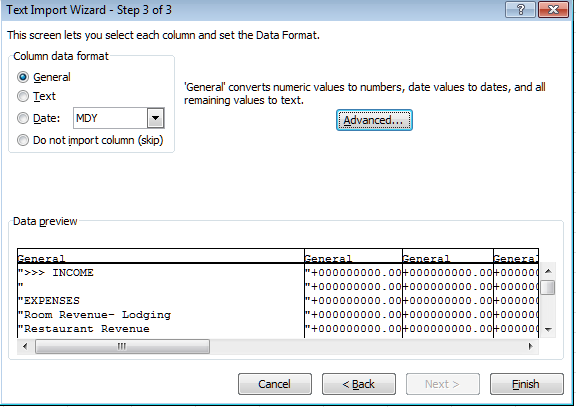 In Excel, go to Data - Get External Data - From Text. Your version of Excel may be different. Notre: We do not provide Excel help or training. Import the file as a Fixed width file. The file will import into Excel. You can create reports or make changes as you wish within Excel. Email us if you would like a quote for on-site or remote training.